It's important to know the meaning of 'hoax' so when you see one you'll appreciate the gravity of involving your business in one. A hoax is a deliberate falsehood masquerading as the truth. It stems from the phrase 'hocus pocus' known as words spoken by a magician while hiding the truth in some illusion. 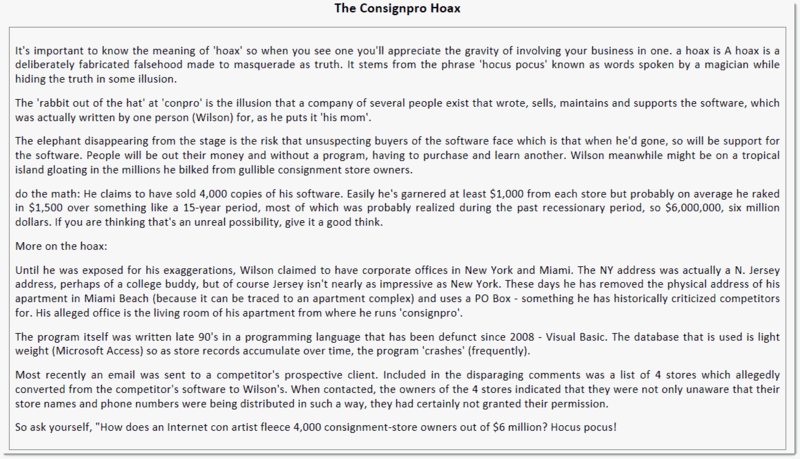 The 'rabbit out of the hat' at 'conpro' is the illusion that several people wrote, sell, maintain and support the software, which was actually written by one person (Wilson) for, as he puts it 'his mom'. The elephant disappearing from the stage is the risk that unsuspecting buyers of the software face which is that when he's gone, so will be support for the software. People will be out their money and without a program, having to purchase and learn another. Wilson meanwhile might be on a tropical island basking in the millions he bilked from gullible consignment store owners. Do the math: He claims to have sold 4,000 copies of his software. Easily he's garnered at least $1,000 from each store but probably on average raked in $1,500 over something like a 15-year period, most of which was probably realized during the past recessionary period, so $6,000,000, six million dollars. If you are thinking that's an unreal possibility, give it a good think. Until he was exposed for his exaggerations, Wilson claimed to have corporate offices in New York and Miami. The NY address was actually a N. Jersey address, perhaps of a college buddy, but of course Jersey isn't nearly as impressive as New York. These days he has removed the physical address of his apartment in Miami Beach (because it can be traced to an apartment complex) and uses a PO Box - something he has historically criticized competitors for doing. His alleged office is the living room of his apartment from where he runs 'conpro'. The program itself was written late 90's in a programming language that has been defunct since 2008 - Visual Basic. The database that is used is light weight (Microsoft Access) so as store records accumulate over time, the program 'crashes' (frequently). Most recently an email was sent to a competitor's prospective client. Included in the disparaging comments was a list of 4 stores which allegedly converted from the competitor's software to Wilson's. When contacted, the owners of the 4 stores indicated that they were not only unaware that their store names and phone numbers were being distributed in such a way, they had certainly not granted their permission. So ask yourself, "How does an Internet con artist fleece 4,000 consignment-store owners out of $6 million? Hocus pocus!